Stylish and versatile, the Mens Velvet Renaissance Pants are essential additions to any Renaissance mans wardrobe. Made from antique velvet, these calf-length pants are suitable for a wide variety or historic reenactment looks. These Renaissance pants are fastened at the waist by a button-fly closure, and the metal buckles at the leg cuffs can be adjusted to cinch or loosen the opening. 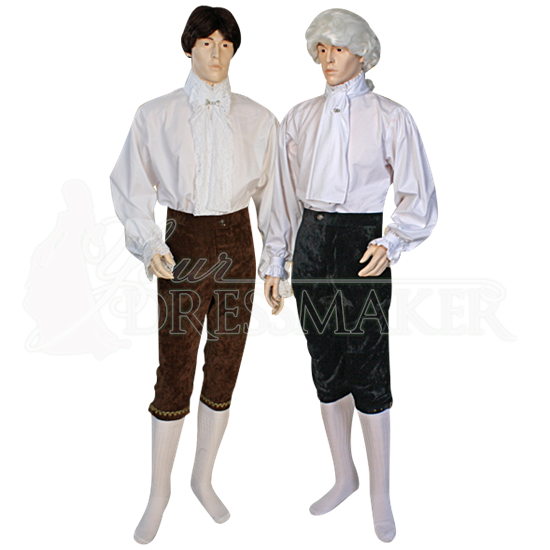 Wear these all-purpose reenactment pants for Baroque and Renaissance styles as well as for fashionable medieval nobleman looks. Choose from several color options and optional golden trim on the leg cuffs to get the style that best suits your next historic outfit.